We Care! ..... and it shows! Hi Team, Thank you very much for fixing my music box. It plays beautifully and sounds even better than I remember. Thank you! Best, Audrey. Hi Ron, The replacement music box arrived today, and I can't thank you enough for your outstanding service, and incredibly quick service. I'm so thrilled to have this gorgeous music box as part of my life, so thank you for making it possible. All the best, Meredyth. Hello. The music box arrived last Tuesday. I have been out of town until today so didn't get to open it until now. I am happy to report that it arrived in good condition and plays beautifully! That was a really nice protective box you built for it. A good thing because the outer packaging had been damaged and dented and we were a bit worried, but the inside was protected by your making that cover. Thanks for you patience and hard work in making this work again. I truly appreciate the time and effort you took to making it work again. Thank you! FYI received the box yesterday. It is perfect & exceeded expectations. It is indeed a keepsake worthy of a lifetime. Received my music box today. Very fast response to my order. I appreciate that. Very happy with my choice and was more then I expected. In the future I will be placing more orders. Thank you. I love the music box. Bobbie B.
I just gave my girlfriend her music box with the custom disc for her birthday and it brought tears to her eyes! We could not be happier. Thank you so so so much. I'll be sure to pass your info along to anyone who may be looking for a similar gift. Beautiful work. Thanks again! George W.
I`ve got my musicbox today, it`s so amazing! Great thanking for you! I will recommend your site to my friends. Hey Ron, The pleasure was all mine. Your understanding and patience at such a difficult time was stellar to say the least. You’ll recall I spoke with you on the phone last Wednesday and ordered a music box for a friend, to replace one she had been given by my mother, now deceased, which had been lost in a flood. What great service! The music box was waiting for me when I got home Friday evening.And my friend loved it. Thank you so much and I certainly appreciate your quick response. I'm sure to order from you again soon! I cannot tell you how delighted I was with the parcel I received from you on Monday evening – I never imagined my rather complicated order would arrive so quickly and easily, and your kindness in including a little “something extra” was just overwhelming to me. I apologize for not contacting you sooner, but it has been a difficult week and I did not have a chance to actually try the discs until today. They are, as I’m sure you anticipated, absolutely perfect – the arrangements are lovely and each one plays superbly on my machine. (I was particularly pleased that the custom discs turned out so well – and astonished that they cost no more and took no longer to produce than the regular discs!) And what can I say about my “early Christmas gift”? Not only is it a little gem, but the fact that you would even think to make such a gesture was a gift in itself – one that I will enjoy “showing off” by including the package and your lovely note prominently among my Christmas decorations! Truly, I needed a lift this week, and a treasure chest of musical delights was just what the doctor ordered. Once again, thank you from the bottom of my heart for both your exceptional service and your extraordinary kindness. I hope you will not mind hearing from me again when it’s time to add a few more discs to my collection! All the Best, Debbie A. My orchestra arrived today and I just LOVE them - and they look fabulous on my coffee table – I am over the moon. I just received my tiny violin and flute and I love them! My doll and I thank you! I just got off the phone with my friend in Maine who received your musical carousel. She said the carousel was the most wonderful gift she has ever received. For someone in their 80's, that is saying quite a lot. She said she turned off all her room lights last night and turned on the carousel, which sent her back in time to when she was a child. She was singing along with the tunes while speaking to me on the phone. Thank you for providing such a happy memory for my friend. I received my music box in time for Christmas and I just wanted to thank you a lot for your work. I will surely come back soon and buy another music box. Thank you a lot for your answer and for the wonderful item. The box arrived to me after 3 days exactly,it is in perfect condition,I'm very pleased with my purchase and look forward to buy from you again.Thank you and keep up the good work. The music box just arrived last night and is simply beautiful. It was the perfect gift. Thank you so much. Just a quick note to say I received my Music box yesterday, safe and well. Thanks heaps I love it. Just want to let you know that the music stand arrived yesterday, and it's gorgeous! Thanks so much! Take care! Just to let you know, I received the music box for my daughter yesterday and am very pleased with how this order was handled. Not only did you keep me informed, but also that it arrived much sooner than expected and it's absolutely lovely! Just what I had in mind. Thank you so much. Received my order today -- and thanks for your follow-up phone call ... your attention to customer service is most appreciated!! We received the music box in good condition and the wedding went well. Thanks. Andy D.
Hi there! Just letting you know that my order arrived today and the children's musical instruments are adorable! Thanks so much for shipping so promptly--my niece will be so excited! Leah P.
I received my fountain yesterday, I am ecstatic! Many thanks for being so efficient! Kind regards from France, Mahine B. The music box arrived today. I am very pleased with the item and the service is superb. Thank you, Rick K. Canada . I just wanted to let you know the CD arrived today and it's great. Just what I needed for my granddaughter's performance. Thanks,John R.
Thank you, for your update and great service. We sent Chauncy and his "Sunshine" off today to be the star of our grandaughter's first birthday celebration. Thanks again for all of your help with this special gift. Sincerely, Patricia P.
Thank you for your very efficient service. The Carousel Music Box received today is beautiful. Thank you again for your quick and reliable service. I shall be ordering again. Sincerely, Joe K.
Our order arrived much to our surprise and also, delight. Thank you for your assistance.BD M.
I just recieved my order and I just wanted to tell you that it is perfect. It is a birthday gift for my best friend and she will love it. Thank you. Lisa S.
Thank you very much! I am surprised that you moved so quickly, especially with the different music of the wedding march in it. I like your web site and have listened to the song. That is very nice to be able to do. I am establishing a tradition by giving this to my wife, where I will be back for more of these music boxes to build her a life time collection. Thanks again, very much! Cole B. Received in great condition. Enjoyed doing business with you and look forward to doing more. Received the music box of Friday. It was exactly what my wife wanted. Simple yet elegant! I recently ordered a miniature guitar and have received it already. Thank you for your extremely quick service. I will be doing more business with you in the future and will tell my friends how professional your company is. It has been a real pleasure doing business with you. Thank you again, the guitar is adorable and my friend will just love it. Sincerely, Kathy H.
Thanks for getting the order out. It arrived Friday afternoon, and I installed it in the box my son had made, just in time for the wedding that afternoon. I appreciate your service, and look forward to doing business with you again. Perry W.
I recieved the order today and they (round transparent music boxes) are beautiful. I can't tell you how happy I am to have found you. Thank you, Suncerely, Becky T.
We received the order, and I'd just like to thank you for getting it to us so quickly. It was beautiful, and the band members were able to present it to their teacher the night of the concert. I can't thank you enough for your help with this! Chris D.
I am just thrilled with the trumpet and want to thank you for exquisite service. I received the package today and the piece arrived in perfect condition. Much success to you and the company. Sincerely, Lisa B. You'll probably enjoy this story about what I need it (blue note chimes) for. I have three small Maltese dogs. A friend told me, about 6 years ago, that I could teach them to ring a wind chime as a bell when they wanted to go out. I tied my first Blue Note at doggie height, rang it every time I took them out, and a week later I heard a "ding." My dog, Bailey, has been ringing it ever since. He's taught two other puppies that we brought into the family over the years. We have a vacation house that we started taking "the boys" to this Spring, and so we need another "go outside bell." I found you on the internet, and was really happy to find the identical wind chime. Thank you so much. Karen, Bailey, Frankie, and Mr. Woof. CA. I just wanted to drop you a note and thank you for your prompt service concerning my Christmas order. I had placed the order quite late, and it arrived right on time. I appreciated that immensely. You were also out of stock on the Red Toy Electric Guitars, and had replaced it with the Blue, wondering if that was acceptable. It was quite acceptable, and I thank you for taking the initiative and sending it, knowing that time was short. I was completely satisfied with your service, and I hope to be purchasing from you in the future. Thank you again for your efforts and have a great New Year. Sincerely, Bob B.
I received the music box and it is beautiful. Your service was great and I appreciate how you followed up on everything. Working with you and your business was a very pleasant experience. Thank you, Eric J. Just to let you know, I received my order and am DELIGHTED with the instruments - they are such well crafted miniatures, I know I'm hooked for sure. Best regards - Marie W.
Thank you, for your follow-up on my earlier telephone call. It's refreshing these days to do business with somebody who follows up on things....and this matter was important to me, because the music box was the center piece of some Christmas celebrations are planning. Thanks, again! Kenneth G.
Hello to the staff at the Music House: The stand arrived Friday afternoon in time for our event. Many thanks for your attention to this matter. I could not have been more pleased with your service. Bill P.
I just ordered a toy violin on your website--thank you for making it such a fast, easy thing to do! I've ordered lots of things recently for Christmas, and your site by far was the most user-friendly and FASTEST! I appreciate that! Pam N.
Just wanted to say thank you for your quick turn-around time. the whistles are perfect as is your service. have a great day. Arlene Z. We received the trumpet today. It arrived in perfect condition. Thank you for being so nice. If other parents are interested, I will tell them about you all. Butch I. This is a wonderful website and everything is easy to access and has great descriptions. I'm impressed with the quick shipping also and fast replys. I will definately use this again and tell others. Thank you so much!! Kari H.
Thank you for your diligence in keeping track of this order. We have received the music stand and it is lovely. Thanks again. Linda M.
The angel music box arrived on August 6th just in time for the birthday surprise! He put a ring inside and asked her to marry him...she said yes! Thanks again for your GREAT customer service... :) Penny A.
I just wanted to say how pleased I am with the toy violin I got from you! It was exactly what I wanted for my grandson's birthday! I also wanted to thank you for your prompt service...I only called Monday and it arrived yesterday! The lady I spoke with on the phone was very pleasant and I enjoyed doing business with you! Thank you again! Norma W.
Thank you very much for the notice, I am pleased to tell you that today I received word that the package arrived successfully. I look forward to delivering the windchimes to my mother, who has wanted them for a very long time. Please also be advised that it was a pleasure dealing with you. I tried to order these chimes from another business operating over the internet and was met with a hostile and defensive customer service representative who was entirely unconcerned with addressing my concerns. After such a frustrating experience, I am pleased to have had such pleasant and successful dealings with your business and think that your service should not go uncomplemented. Thank you again, Margaret C.
My order arrived on Friday. Thanks for having a web site, a toll free number and quick service. The Music Box and the individuals who received it as a gift just love it. Thank you. Peggy D.
I received the Music box and am very pleased with it. I'm sure my wife will love it. Thank you for making available such quality products. Sincerely, Derek R.
Thank You for your help. I am now finished with my Christmas shopping. I will keep your catalog handy for future gifting. This box will make one special person very happy. Happy Holidays! Claudia L.
You've been a real treat to work with and I can't wait to give Susan the music box - Thanks Again! My order arrived as promised on Saturday - I succumbed to a little pressure and allowed Susan to open this gift early - It's gorgeous - everything I expected! Thanks again - you'll hear from me shortly as I order a couple new disks! Also, if you have anyone up there questioning how useful your internet site is - I can attest to how easy to use and professionally set-up it is - A Class Act all the way!! Joe B.
I wanted to let you know that I received the music box a couple of days ago. I am extremely pleased with it. It is more beautiful than I thought. I really appreciate all the help that I received. Adding Pachebels was the perfect touch, and I know that come Christmas morning, the lady that receives this will be very happy. Thank you again. Sincerely a pleased customer, Jacob S.
I just wanted to thank The Music House for a VERY well received Christmas present. Your music box was beautiful and it was a tremendous success. I just wanted to thank you and let you know I have told my family and friends about you guys. Thanks again. A Very Satisfied Customer. Brian C.
You have been very helpful and i'm glad to have dealt with you and the music house. Take care. Jeff L.
Thank you for your email, and I look forward to receiving my new music box. I really appreciate the way you do business, and I plan to tell my friends about your company. Take care, Lauren J.
I received my music box works yesterday, all in good order. I wish to thank everyone at the Music House for their excellent service. A special thanks to Tony for his mechanical expertise - The old box never sounded so good and it does have excellent tone. 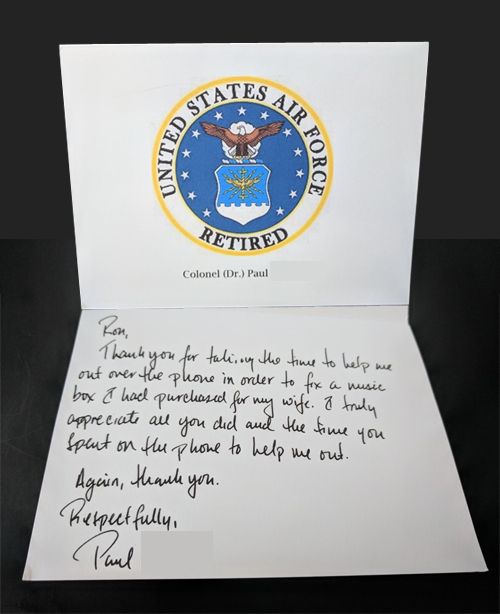 Sincerely, Paul E.
The singing bird snuff box arrived ...my daughter loved it and so did I...thank you again for getting this order out to me so quickly. Sincerely, Judy T.
Thank You for your prompt service. It is greatly appreciated and there will be a big smile on my grandson's face Saturday for his birthday. Star C.
The new music box arrived on Friday, and my daughter is just delighted. Thank you so much for all of your help. Sincerely, Anne P.
Thanks for following up. I'm so glad that the rose was shipped out! Thanks for letting me know. I spoke with our client on Friday, and I know that receiving the music box from us will be a positive influence on our relationship with her. You and your staff have been so helpful... I know without a doubt that your company will be utilized again when we require special gifts for our clients. Many, many thanks..... Lori R.
I received my order in time. The boxes are lovely and the music is delightful. I'm thoroughly pleased. Thank you so much for the great service. I picked up the drum today....... my son and I will have a lot of fun with it.... there was no problem with customs. I will definitely be ordering from you again in the future. You don't know how much I appreciate the attention you gave my order. We moved to Langkawi (an island off the northwest coast of Malaysia, right on the Thai border) from New England and have found it excruciatingly difficult to get what we want here. I just spent the last two weeks trying to get an outdoor playset sent here.......and failed miserably. I ended up flying to Kuala Lumpur (the capital of Malaysia) where there happens to be a ToysRus store (for all the Americans there, no doubt) and bringing a playset back with me on the plane...... It seems that shipping items within Malysia is extremely expensive; it's cheaper to send something from the states... but then you have the size restrictions and these outdoor playsets can be quite large. This island is very, very limites. There weren't any paves roads until about 6 years ago! Now it's a booming tourist retreat. Once again, thank you so much, Gina P.
Just a note to say I received the music movenent and thank you very much it;s the prettiest movement I've ever heard thank you once again. Mark S.
Received the music box today. It is just what my daughter wanted! Thanks so much for the good service. I will be a return customer. Happy holidays, Joann H.
Just a note(in case I forgot) to let you know I received the music boxes yesterday. I am very happy with them & I am sure my daughter & daughter in law will love them. Thank you, Marlene D.
Hello, I just wanted to inform you that I got my Heart Inlaid Music Box and it is exaclty what I wanted. Thank You for your help. Patrick B. Received the drum set and my nephew was delighted, it was a beautiful drum set, sight unseen when ordering , I thank you for your assistance, I was tentative about ordering over the internet, but very pleased with the end result and your service...thanx again. Judy P.